Anita, what a beautiful card! Love the wildflowers embossed on that pretty paper! what beautiful papers and what a beautiful card. Beautiful card, Anita. And YES, I loved this book and we're going to see the movie this afternoon! Love your card--so very pretty! 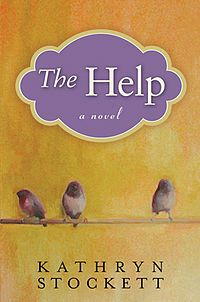 And yes, I saw the movie "The Help|", but I didn't read the book! It was GOOD ( kind of long though). I would recommend you see the movie and see which is better! What a beautiful blue card Anita! Thanks for coming to visit me! Oh I love these blues with the white embossed over it Anita! I just recently saw The Help, it was an awesome movie! Oh my, the blues on this are so dreamy looking, LOVE this! What a gorgeous card! I'm about to start reading this book too. I saw the movie and LOVED it!